Basheer Othman still can’t join his wife in the United States. When President Trump’s second attempt at his “Muslim ban,” which he signed Monday, goes into effect on March 16, it will look no different to Rabyaah Althaibani from the first executive order. 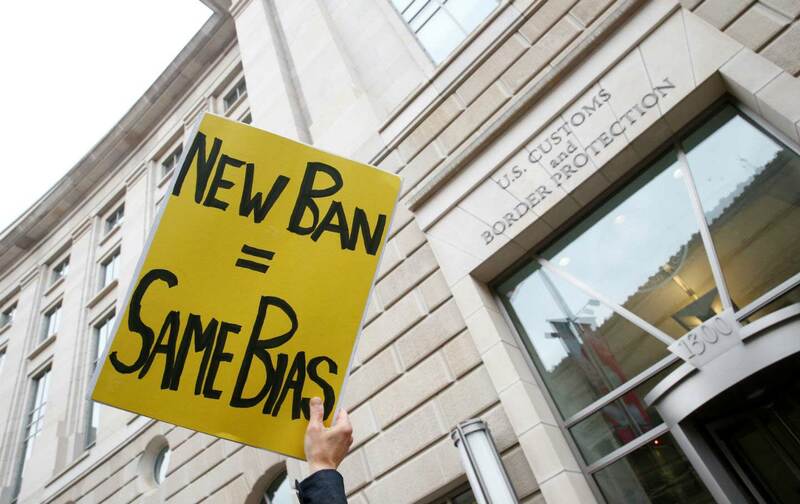 The new executive order, twice as long as the first and more narrowly tailored, will ban people from six countries—Iran, Libya, Somalia, Sudan, Syria, and Yemen—from immigrating or traveling to the United States for 90 days. Iraq is off from the original list of seven banned countries, and in the latest executive order green-card holders and current visa holders are expressly exempt from the ban. There are no more special mentions of prioritizing refugees who are members of “minority religions,” which was interpreted as giving priority to Christians from Muslim-majority countries. But even with these key changes, Trump’s latest executive order is, in intention and function, the same as the administration’s first time around. “Thousands of innocent lives are put on hold, families are being separated,” Althaibani said on Monday from the offices of the New York Immigration Coalition. Althaibani, a Yemeni-American activist who lives in New York and whose family immigrated to America in the 1970s, will still be separated from her family as a result of this major policy change. Her husband, Basheer Othman, fled the war in Yemen, first traveling from Djibouti to India and finally landing in Kuala Lumpur, Malaysia, where he is staying right now awaiting a visa to join Althaibani in New York. The two met in 2010 and forged their relationship in the heady days of the Arab Spring before they got engaged in 2015. They married in Goa, India, in January of 2016, but not before they held an Islamic ceremony in the Bronx, with someone standing in as a proxy for Othman. “I’m secular, he’s secular, but Baba was like, we’re not going to India unless we do the Islamic wedding first,” Althaibani said with a laugh. Two days later she flew to Goa and the two married there. Most mind-boggling to Althaibani is that Othman, a journalist whose work Althaibani said was funded by the National Endowment for Democracy, is far from being a threat to the national security of the United States. To the contrary, he’s fleeing his home country as it’s unraveling in a civil war. And it’s not just her husband. Althaibani says she has an uncle who is also stranded in Jordan with his four children. He’s been vetted and approved for resettlement in the United States, but this executive order jeopardizes his safe passage. It’s for all those reasons that the updates to the Muslim ban ring hollow to Althaibani and others. The bones of the policy remain intact: In addition to the 90-day suspension of travel and immigration by people from the banned countries, refugee admissions will, as in the first version, be slashed from 110,000 to 50,000 in this fiscal year. The entire refugee program will also be suspended for 120 days. The new order continues to maintain that the ban is necessary for insuring the national security of the United States. But even the Trump administration’s own Department of Homeland Security disagrees. A report that was leaked to the press shows that the DHS couldn’t find evidence that nationals from the countries on the banned travel list posed a threat. According to the Associate Press, the report was part of an internal review that Trump ordered after his first executive order got snagged in dozens of lawsuits and nationwide protests. On Monday, the very same legal organizations that challenged the first executive order—among them the National Immigration Law Center, the ACLU, and the International Refugee Assistance Project—promised to continue fighting.